In 1965, a seventy-year-old man--soon to be known as Prabhupada--set sail from India to America with a few books in his bag, pennies in his pockets, and a message of love in his heart. He landed in New York at the peak of the revolutionary counterculture movement of the '60s, and went on to spark a global spiritual renaissance that led to the creation of the International Society for Krishna Consciousness, which has changed millions of lives. 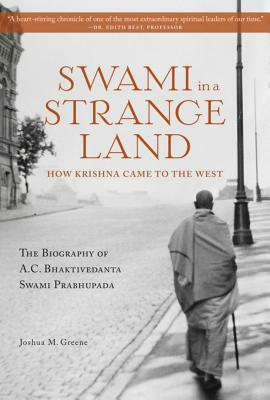 Through the depiction of Prabhupada as both an enlightened luminary and a personable, funny, and conscientious individual, Swami in a Strange Land shows why cultural icons such as George Harrison and Allen Ginsberg incorporated Prabhupada's teachings into their lives, and why millions more around the globe embarked upon the path of bhakti yoga in his footsteps. Carefully researched, skillfully crafted, and extraordinarily intimate, this narrative follows Prabhupada as he rises from an anonymous monk to a world-renowned spiritual leader. Set in locations as far ranging as remote Himalayan caves and the gilded corridors of Paris's City Hall, Swami in a Strange Land traces the rise of Eastern spirituality in the West--and in particular, the rise of yoga culture and vegetarianism and the concepts of karma and reincarnation. Joshua M. Greene has produced films for PBS and Disney, has served as vice president for New York's largest PR firm, and was appointed director of strategic planning for the United Nations Peace Summit of Religious and Spiritual Leaders. He was also an adjunct professor at Hofstra University in New York. His previous works include the best-selling Here Comes the Sun: The Spiritual and Musical Journey of George Harrison; Justice at Dachau: The Trials of an American Prosecutor; Witness: Voices from the Holocaust; and Gita Wisdom: An Introduction to India's Essential Yoga Text. In 1970, he was initiated as Yogesvara Das by Bhakivedanta Swami Prabhupada and served for thirteen years in Prabhupada's society as director of French-language publications.